New stitches can be exciting to try and master! I remember all too well when I began knitting all the texture stitches calling to me, "Try me! No! Try me!" What I wanted to try were the cables, even the easiest ones intimidated me in the beginning. All that putting stitches onto a cable needle, losing them while knitting from behind. Yikes! It was a bit frustrating until I got the hang of it. Constantly making swatches gave me the confidence to try more unusual stitches and master them. Fashion, at the moment, loves patchwork which brings me to the topic of swatches. 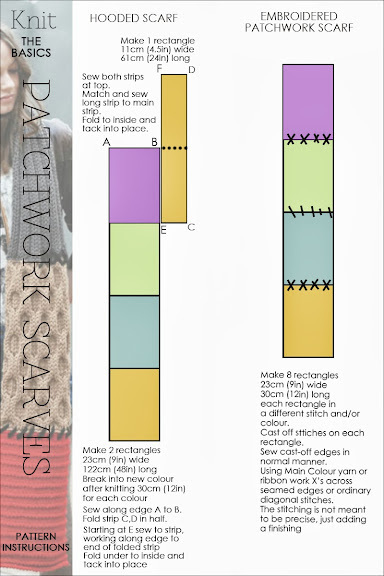 What better way to practise your knitting than to get a few odd balls of yarn, make rectangles and sew them together for a fashionable scarf. 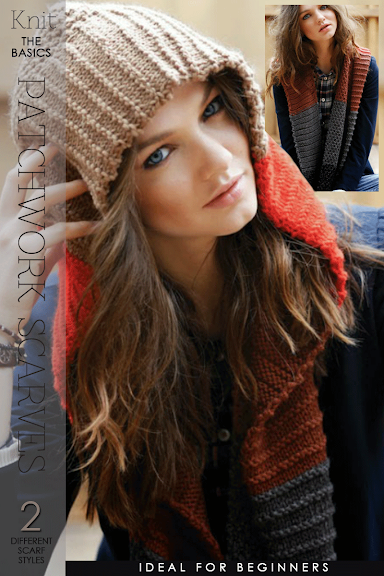 Read further for more inspiration and how to make a hooded scarf. As you can see the knitting is not meant to be a master class project! These two projects are ones you can certainly begin with, trying out new and different stitches. You definitely won't be bored.